We want to send a Strong Message to US Manufacturers that Americans want products Made in the USA! We want to help create jobs in the United States by increasing the demand for Made in the USA products and services. We want to show retailers that there is a need to offer more products Made in the USA. We want to show that Americans united can create jobs without legislation. We want to increase media attention about the need for US Manufacturing. We the Consumers of the United States must unite together and take action. Legislators like to make promises and talk about creating jobs, but can they really fulfill those promises and is it really their responsibility to do so? While the politicians try to find answers to those questions, let’s stand up for our country, unite together and take action by not just talking about buying products Made in the USA, but actually doing it. Sign the Pledge and send a strong message to US Manufacturers that you are tired of outsourcing, off-shoring, the loss of jobs, the downturn in the economy and cheap imports. Tell them it’s time to bring the jobs home. Buy Made in the USA products whenever you shop online or in stores. Read the labels when you are shopping. Ask manufacturers to offer Made in the USA products. Ask store managers to offer more Made in the USA products. Encourage family, friends and fellow Americans to Buy Made in the USA Products. It is not always easy to purchase Made in the USA during the holidays. It can be difficult to find just the right gifts and of course with all of those tempting Black Friday deals on imported gifts, it can be a challenge to fit Made in the USA products into your budget. However, we have found that Made in the USA is getting to be more cost effective and we have made it easier to find. 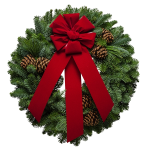 We created the web site www.ChristmasMadeinUSA.com This guide has something for just about anyone on your Christmas list and you will find great prices too. The upside to buying Made in the USA during the holidays is that you are helping to create jobs for the hard working men and women who are producing these products here in America and you are telling retailers that you are tired of imports. You want more selection and you want quality Made in the USA products when you shop. While it is still impossible to find most electronics Made in the USA, the clothing industry as well as toys and baby products are making a strong comeback. So take a moment to visit the Made in USA Christmas Gift Guide and share it with everyone you know. Lets keep Americans working! Most everyone loves the sun and fun of summer. The great BBQ food, spending time outdoors, camping fishing and so many other fun activities. We all think about our health a bit more in the summer. Many of us wishing we had stuck with our new years resolution when we try on our summer clothes in the spring. But with a bit of hard work and self discipline, we manage to get into the clothes we love by the time summer arrives. Our personal health is important and so is the economic health of our nation. We are many would argue the greatest nations on earth. However, our economic health is failing. Yes we can blame a great deal of this on our illustrious politicians who support job destroying trade deals but at the same time we have to take some of the responsibility. Just like our physical health, it is up to each of us individually to make a conscious effort to improve our situation the best we can. While the solution is not always cut and dry, there is a way we can all contribute without a great deal of effort. In the summer, we are buying things for our home to spruce them up, for our vacations even if they are staycations or weekend trips. From clothes to yard, to home improvement, we do a lot of shopping. The stores know it and they push some great deals on us. However, when you take a good look at those deals are you really saving? When we take a moment to read the labels when we shop and see that it is imported, perhaps we can look for another item that is made in the USA. If we all spent just $64.00 a year on Made in USA products 200,000 jobs would be created. These jobs add money back into our local economies and improve our nations overall economic health. Imagine what we could do if we united in this cause and vowed to spend $200 – $500 per year on American Made products. We would soon find that we no longer have an unemployment problem and our nation would be thriving once again. When Americans unite on an issue, we are an unstoppable force. According to the National Confectionery Association, Americans are expected to spend 2.3 billion dollars on Halloween candy and a total of 8 billion dollars on Halloween. 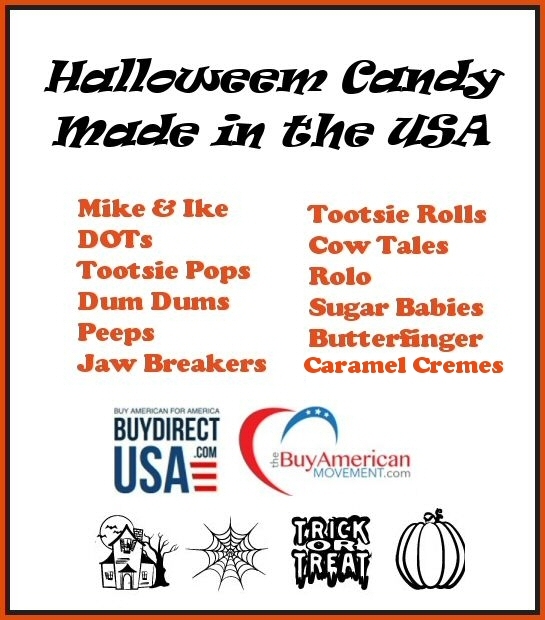 The report does not state where the products are made but we do know that most of the costumes and decor as well as some of the candy are not made in the USA. Please take a moment to post your favorite Halloween Candy brands and where they are made. If you happen across costumes and decor made in the USA feel free to post them as well. You would be surprised at how much of it is made in China and Mexico. This is a great opportunity for you as well as anyone you know who hands out candy to just take a moment to turn over the package and read the labels. You can also use this as an opportunity to teach your children by example if they are at the store when you make the purchase. Explain to them why you are looking at the label and why it is important to make sure they purchase Made in the USA products as well. Let’s unite as Americans and help create jobs, improve the economy and keep America working. For Halloween Candy, Baskets, Home Decor & Decorations Made in the USA. Shop at: Goetze’s Candy and BuyDirectUSA.com. If you have been down the Easter candy aisle of your local big box store this year you may have noticed the wide assortment and variety of Easter candy that is available. Gone are the days when a simple chocolate bunny or bag of jelly beans will do. Now we have Star Wars bunnies, princess bunnies, marshmallow treats and more. Yet among all the sugar laden treats and brightly colored packaging there is something amiss in the world of Easter candy. Something you should know before you stock up on the Easter themed goodies that you will be filling your child’s Easter Basket with this year. No longer is it safe to assume that the candy you buy is Made in the USA. In fact a lot of it is now Made in China or Mexico. The only way you will know for sure is if you turn that package over and read the label. If you find the words Made in China or Mexico on the item, don’t buy it. Perhaps next year the big box stores will stock more of the Made in USA candy instead of adding more Made in China or Mexico to their product offerings. Have a wonderful Made in USA Easter in 2017.